Users with the Control credit card processing module can process credit cards online without need for terminals. This document discusses the steps to set up Control this processing. specifications_for_usb_magnetic_card_swipes can be purchased from Cyrious or elsewhere in order to capture the magnetic track data (and obtain more favorable rates), though this is not required in order to use the module. Ensure you are running Control 4.4 or higher so that you are PCI compliant. Purchase the module from Cyrious. Apply for a merchant account through capital_q (for U.S. users) or nxgen_canada (for Canadian users). Obtain the configuration information from capital_q or nxgen_canada. Enter your account information and activate online processing. Click on Help | About Control … on the menu. Confirm that the Version number begins with 04.40 or higher. You can check if the module is authorized on the Database & Module info on Help | About Control … dialog. If you have “Credit Card Processing” under the list of modules authorized then you already have the module installed. To order the module, contact Cyrious Technical support by emailing support@cyrious.com or by calling 888-552-9823 in North America, or 1-225-752-2866 outside of North America. After processing payment (online of course!) Technical Support can connect to your system and immediately authorize the module in your system. Apply for a merchant account through capital_q or nxgen_canada. Cyrious Software only supports credit card processing through capital_q, who uses Elavon. While this may exclude many good suppliers, for support and reliability reasons Cyrious has elected to only maintain one strategic partner in this area. Fortunately, capital_q's very open cost-plus pricing model has resulted in great savings for Cyrious users and Cyrious is very pleased with the alliance. To sign up, go to http://www.capitalq.com/cyrious or contact capital_q directly using this capital_q. 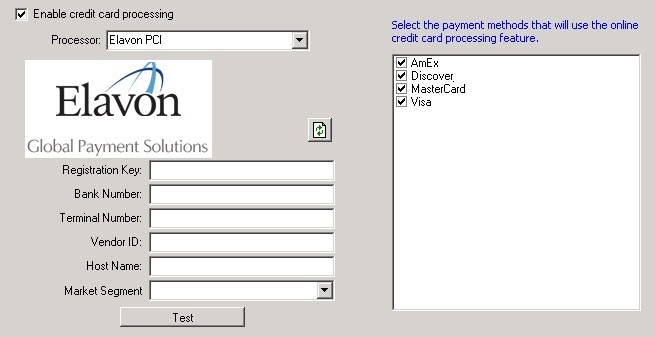 Cyrious Software only supports credit card processing through nxgen_canada, who uses Elavon. While this may exclude many good suppliers, for support and reliability reasons Cyrious has elected to only maintain one strategic partner in this area. To sign up, go to this page for their nxgen_canada. Registration Key: Your registration number. Bank Number: The processing bank ID. Terminal Number: The ID of this “terminal”, or client processing machine. Host Name: The address of the processor. Usually “webgate.viaconex.com”. Market Segment: The type of customer you deal with. Usually “Retail” if you have a lot of in-person payments (card present) and “MOTO” if you are dealing with remote payments (card not physically present). Click on Setup | Accounting Setup. Select Credit Card Options on the list on the left.If you don't see this option, the Credit Card module is probably not enabled. Contact Cyrious Technical Support to purchase this module. Check the “Enable credit card processing” checkbox. Select “Elavon PCI” as the processor. The merchant information is not normally ever brought to Cyrious Control (the processing happens through the SSLIP) so you will need to click on “Click here to retrieve and view the configuration settings” in order to make changes. Enter the configuration information provided by capital_q or nxgen_canada. Select the payment methods that you want to process online. Warning: Enabling credit card processing does not take effect if you don't check the boxes to apply it to that payment method. Warning: American Express and Discover are separate processors that must be enabled when setting up your capital_q or nxgen_canada account. If you accept these payment methods ensure that you let capital_q or nxgen_canada know when you are creating your account. Click “Save” to save the information. Click on the “Test” button to confirm connectivity to Elavon's gateway. You should receive the response “Test Successful.” If you receive another message, reboot the server computer and retest. If you still receive an error message, contact Cyrious Technical Support. Close the “Accounting Setup” window. Congratulations. Your system is now setup to process credit cards online. capital_q also recommends that you set up an account at the site below and use it to view your processing once it has been sent to their system from Control.